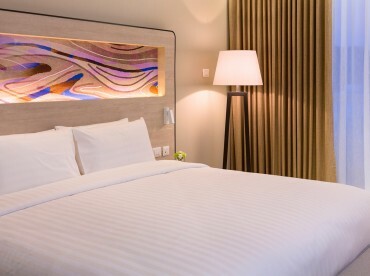 Our contemporary Junior Suites include a living area for relaxation, a king-size bed for a restful night’s sleep, and a spacious bathroom, all enhanced by views of Phuket Town, the bay and mountain. Complimentary Wi-Fi allows you to stay connected and work with ease. Suitable for up to two adults and two children aged below 16 years old (no extra bed).